Tried AVLinux? What do you think abou it? Yes - And it's the best thing ever. Why buy Protools? Yes - Not bad at all, but not as feature rich as I need. Yes - but it didn't suit my needs, I'll use something else. Yes - But I was utterly lost with it or couldn't make it work. No - But it looks pretty cool. All you need to do is download a bootable Linux CD, such as AVLinux, boot your computer with it, plug in your guitar using the realtone cable, and run the software on the CD and you can unleash a vast array of guitar audio effects (pedals), as well as easily record yourself (with multiple tracks), add vocal tracks, etc. If you have a MIDI capable drum kit or keyboard (especially with an M-Audio MIDI adapter), you can very likely use them as well. And the best part: it’s free. 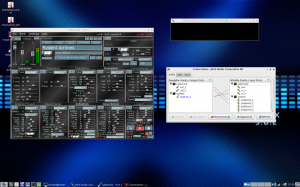 There is zero cost for the software as it is based on an Open Source operating system (Linux), and Open Source applications such as Rakarrack, Guitarix, Ardour, Soundgarden and others. AVLinux also comes with commercial software, and previews of other available tools, but everything on the CD is free to use. The below steps are written assuming you know nothing whatsoever about Linux. If you get stuck you will find there are many online forums where help is available. NOTE: Please see the AVLinux user manual, found on the desktop – it is an excellent guide and will quickly get you started. Also, get help from a computer geek friend – especially if they know anything about Linux. (Make sure to provide the beer.) It might seem daunting at first, given the extent of software available, some of which is very full featured, and complex. However, you should be able to at least get up and running so you can hear your guitar and uses pedal like effects pretty easily. 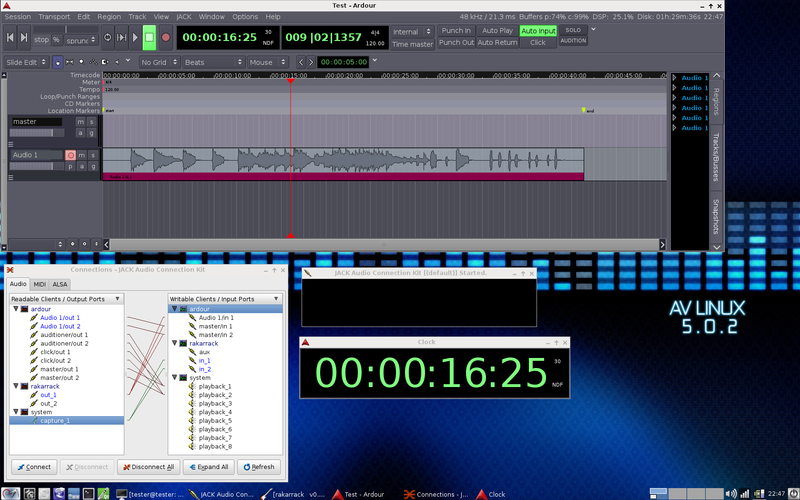 From there you can dive into the more complex tools, like Ardour for recording, etc. While there are many flavors of Linux other there, and several ways you can do this, I highly recommend downloading the LiveCD version of AVLinux from here. Be patient, it may take several minutes for the desktop to appear. Now, simply plug in the Realtone audio cable. Next, you must configure the system to use the Realtone cable as the proper input, and the computer as the output. 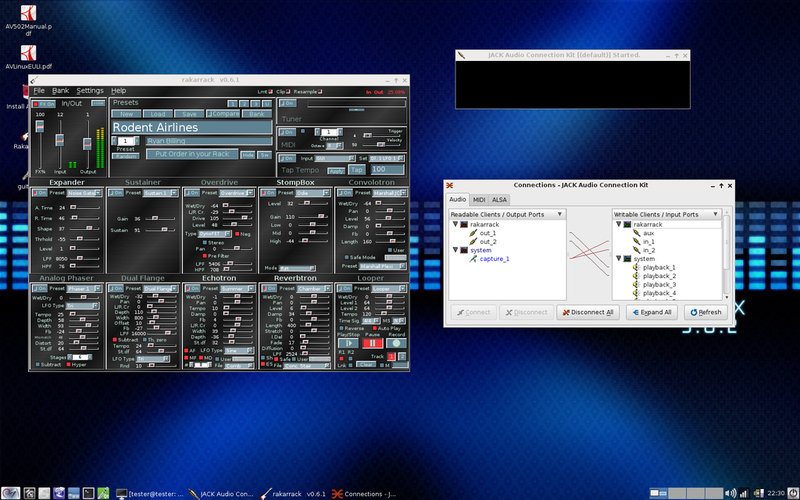 This is done using the Jack audio server, which can be controlled by running qjackctl. There is a little green icon on the system tray at the bottom of the screen which will start qjackctrl. TOP TIP: Click on the > button in Jack next to the input device to see more descriptive names for the inputs and outputs. If you just try to use the drop down menu (hw0, etc.) it is easy to get them wrong. The Realtone cable will be list as a “Rocksmith USB Guitar Adapter” or “Hercules” or “Sony Entertainment”. TIP: the red and green power lights on the left must each be powered on by clicking it for it to be active in your effects loop. TOP TIP: Many users find the default patch bay display in JACK very confusing. You can also try out Patchage, in the audio application menu, which I find displays the patch connections in a much more intuitive and manageable way. Also see this helpful diagram of how to connect guitarix to JACK at the Guitarix site. You can now jam away, and explore a huge number of guitar effects. Add more effects from the Options -> Mono Plugins menu. Chain them together to get the exact sound you like. Want to record yourself? 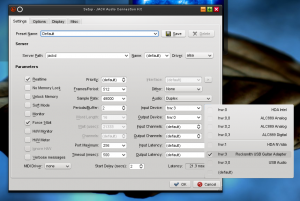 Try Ardour – also already installed and available in AVLinux. Plug in a USB microphone (Rockband and Guitar Hero ones work fine), configure it in Jack and you can record vocals in Ardour too. 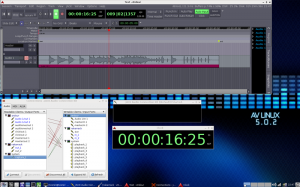 (Ardour has extensive features, and you will want to head over to the website to check out the tutorials.) For keyboards check out Rosegarden and for Drums try Hydrogen. Running from the LiveCD is a great way to get started, but you most likely will eventually want to install AVLinux either to a USB stick, or to your computer. This will allow you to save changes, and improve performance. The AV Linux control panel on the system tray even includes an option to make a bootable USB stick, as well as many other very useful tools. This attention to providing a very user friendly environment, and the excellent user guide on the desktop are additional reasons why I recommend AVLinux. Take your playing and skills to the next level using powerful and freely available open source tools. Linux is a fantastic platform for musicians, and the number and quality of tools available is impressive. If you run into trouble, you will likely find places like Linux forums, and forums for tools like AVLinux, Rakarrack, and Guitarix, to be quite helpful. It can get complicated, its true. But if you stick with it you will be well rewarded. Then re-try the speaker test. This must work before JACK or any other applications will. Plug in the Realtone cable and see if udev correctly detects it and assign it as an audio device. Running for a LiveCD forever is not the way to go. Instead, you can install AVLinux as a virtual machine using VirtualBox. You will also need to VirtualBox USB extensions. Note there is going to be increased latency this way for sure, in fact so far the latency has made it pretty unusable in my tests. You may well need to increase the “Frames/Period” in JACK settings to 1024 or even 2048. I did have trouble with the VM crashing in VirtualBox (4.1.6) running on my OpenSuse 11.4 system with VERR_NO_MEMORY errors, despite having plenty of memory allocated to it. It does seem to work okay when I briefly tested it with VirtualBox on a MacBook Pro, OS X 10.6.8 Audio was working okay – though getting the Realaudio cable recognized by the VM was a bit tricky, even when adding a USB filer for it. All in all, my experience shows that due to latency and timing demands, and overhead of the hypervisor may make this unrealistic except under ideal hardware and conditions. A better option would be running from a USB stick, which should run considerably faster than the LiveCD, or better yet of course actually installing Linux. You can install any mainstream Linux distribution (OpenSuse, Ubuntu, Fedora, etc.) on your computer, and then install the needed audio applications for the repositories, or build them from source. However, I recommend using the AVLinux LiveCD to start users off without needing to install anything so they can just jam, have fun, and test drive things. Based on Suse 11.4, this is both a LiveCD and installable Linux environment. It can also be customized using the OpenSuse Build Service, and built a an .iso, usb, or VirtualBox image, which is very cool. You can add guitarix and rakarrack to the build. I do want to test drive this fully, though it lacks the extensive collection of pre-installed audio specific applications that AVLinux offers. Other LiveCD options include the 64Studio 2.0, but that is based on Debian 4.0, which is very old at this point. While 64Studio is available in newer versions, they are not available in as a LiveCD. If you wish to install a full Linux OS, I would certainly recommend looking in to it. Developed for a mix of audio, video and graphics arts. Looks pretty good, but not music focused – and there is no LiveCD available. Wow! Thanks for sharing this info. Props to Ubisoft for using a generic usb sound thing and not using a proprietary dongle. The array of professional open source sound software sure is impressive. Unfortunately, the Behringer cable is not recognized on the PS3, so you will need to get a new Rocksmith cable, Amazon has them for $30. I’m the developer of AV Linux. Thanks for using it as part of your guide. I’d invite any new users to check out the forum if you require assistance or are looking for more info. Thanks for stopping by and for the forum link! I’ll should be doing another post pretty soon on enabling pulse audio in AVLinux for running GuitarPro, which I think might be helpful for some users. Thanks for the work on AVLinux – it is fantastic. Keep up the great info on the blog here…Good Stuff! Gary, You rock with AV Linux I just brought it up. Whoever wrote this page is bitchin because my next move is to plug gs cable in and config, so now I know where to go. 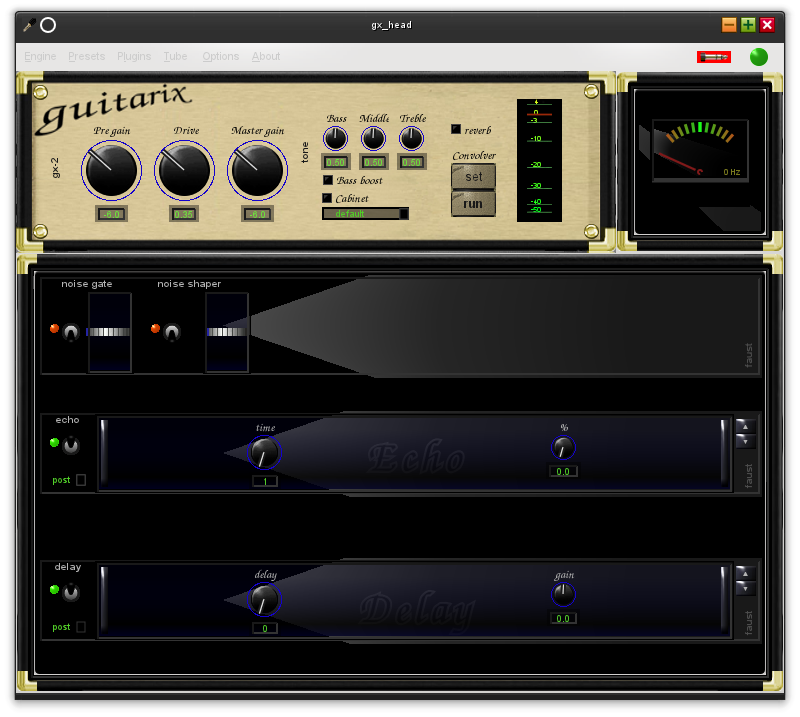 I did load guitarix source because I want to change it for my AMP. It’s not in AV now right? I am new to Ubuntu. I made the change from xp to Ubuntu 11.10 in Feb 2012. installed all the software besides linux av. Do I need it? I have configured the as pictured above but I have no sound from my guitar through the cable into the usb port. Everything else is working fine. How do i install linux av using a usb port? I love Ubuntu. Linux is happiness. Thank you. The advantage of use AVLinux as its own stand alone OS is that it has a great many audio and recording applications not only pre-installed, but also the environment itself has been tuned for optimum performance. Everything “just works” out of the box and works very well. Did you actually tried both ? If yes are they reaaly the same ? I’m considering to buy one of those but, if I would prefer to avoid the rocksmith cable, I’ve seen that the behringer has worse review on amazon. Yes – I tried both. They are different USB sound devices and the PS3 will not recognize the Behringer. Thanks. It’s not for using with a console but for recording on PC. I was thinking to buy the Behringer but the Rocksmith cable had better review , and I was not sure which to choose. I just picked up a Rocksmith cable. I also have the Behringer UCG102. I’m using Ubuntu Studio and I’m having problems with PulseAudio sending sound to the UCG102 headphone jack instead of my sound card while jackd is runnning. The Rocksmith cable doesn’t have a headphone jack, I’m hoping that will solve that problem. I’m also hoping that the Rocksmtih cable will work at 48k. I could never get the UCG102 to work at 48k had to drop it to 44.1k. Not sure if it’s because machine specs (Core Duo 2 2.6GHz) or if the UCG102 is falsely advertised as 48k. Have you tried the UCG102 at 48k and got the latency lower than 5 ms? Can i get the game to work with the behringer on the pc? with linux? Rocksmith is available for PC, and is also on Steam. Hope the Rocksmith cable worked well for you. I was able to get the UCG102 working at 48k, though I don’t recall what the latency was. I assume with Ubuntu Studio you had jack running with RT enabled? You might want to try, just to see, another distro like the AVLinux liveCD, which does not use pulse. Of course changing from Ubuntu studio not not be of interest to you, but trying it out in AV Linux might be interesting just to see. My setup has been OpenSuse, with pulse, and I’ve had pretty good success getting everything to work.